When you compare the Canon 5D Mark III to other DSLRs, its specs fall somewhere between the 1D X and the previous model, the 5D Mark II. But how does it compare to competition like the Nikon D800? 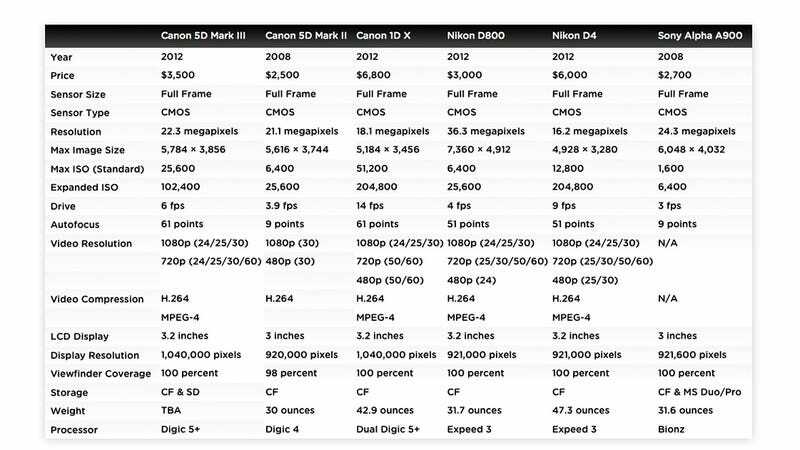 We've put together this handy chart that compares the Canon 5D Mark III to the 5D Mark II (since they are technically still in competition) the Canon 1D X, the Nikon D800, the Nikon D4, and the Sony Alpha A900. Even though Canon hasn't gone the Nikon route by blowing the roof off the megapixel category, the 5D Mark III still looks like it's going to rule the roost at the upper end of advanced amateur DSLRs. Particularly for photography enthusiasts who don't want to carry around a heavy pro shooter designed to endure the harshest of conditions. Of course we'll reserve our final judgement for when we actually get to put it through its paces. But on paper, Canon has built one hell of a camera that's relatively affordable if you're serious about photography.